Today we went to see School of Rock on Broadway. We had a fantastic time and I really enjoyed the show. We rode a coach bus into NYC and started the day by having a nice lunch at Bucca di Beppo. It was fun being in a restaurant with the class and I was impressed by how well behaved and polite everyone acted. The food was good and we definitely filled our bellies. After lunch, we walked through Times Square, an experience in itself, to the theater. The show was the highlight of my day. It had me clapping, cheering, and pumping my fist into the air. 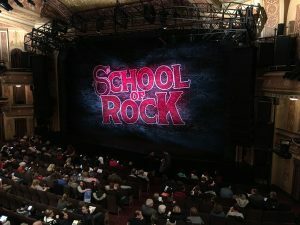 Being a drummer and playing in many many rock bands throughout my life I felt a real connection to Dewey and the other characters in the show. After talking to my students I found that they were also able to make personal connections to the show. Whether it was about following your own passion, dealing with peer pressure, parental pressure, or a feeling of wanting to stick it to the man, this show was uplifting and inspiring. It was amazing that the kids on stage were actually playing their instruments. The bass player and drummer were great, and the guitar player blew me away. He had great chops and a great style. All of the kids on stage were very talented and I am sure they will all continue to follow their passions and succeed. I hope this play inspires others to persevere, follow their dreams, and do what makes them happy. You will have obstacles in life and sometimes it will be tough, but you should always stay true to yourself and do what you love to do. And sometimes you may need to …… stick it to the man! WOW! Mr. Liebowitz you had a fantastic trip! I bet your students loved it. I know the students that I am reading this with would like to take a similar trip 🙂 Was the show as good as you thought it would be? The show was BETTER than I expected! The best part was how all the kids were actually playing their instruments live. Very impressive. That’s so cool your really lucky, i’m only in fourth grade and i’m now waiting until fifth grade for that trip, I didn’t know about that before. Thank you! It is a really great trip. What is your name? Who’s class are you in? When you write a comment try to be very formal. For example, start by writing, “Dear Mr. Liebowitz,” and end your comment with, “Sincerely, your name”. Once I know who you are I will check out your blog. I can’t wait to go see a broadway show at the end of the year. I’ve only gone to two broadway shows in my life, and I want to see another one. Guess what?! You don’t have to wait until the end of the year because we are going to see Anastasia on January 31! It’s going to be awesome!